Having mold, moss, and mildew stains removed from your shingles is one of the easiest ways to maintain or improve the beauty of your home. The blackened areas and streaking you see on your roof is an infestation of bacteria and algae that is feeding, growing and spreading across your roof’s shingles. This type of algae, moss and mold will retain moisture and will prematurely age and cause a breakdown of your shingles. Shortening the intended life cycle of your roof. With our no pressure application and blend of detergents our no pressure roof cleaning, these invasive species are eliminated and your homes beauty is restored. A dirty roof will eventually start to fail to serve its intended purpose. Organic growth and containments will cause a breakdown of the shingles by roots and frozen moisture expanding within the granules and surface slowly breaking away its layers. After a period of no maintenance the roofs surface will fail and lead to a costly replacement or repair by allowing water intrusion into the structure and softening of the shingles. If left unchecked this organic growth and debris can also cause the roof to become too heavy for the structure supporting it causing sagging and dips in the roof lines. With a clean roof water is able to leave the surface quickly by preventing the roof from retaining moisture. As industry trained and certified roof cleaners Intercoastal Exteriors takes special care while treating and cleaning your roof. We look for potential conflicts with the cleaning before we start and offer extra protection to those items or suggest options to still proceed with the cleaning while protecting those items. We only use low pressure to apply detergents and during the rinse. High pressure has no place on a roof and should never be used. It will quickly blast away essential components of the roof system causing permanent damage and cause the roof to be prematurely aged. We use biodegradable products that after a small amount of time become inert and break down into their natural ingredients leaving no danger to the surrounding environment. Customer service is our number one priority while serving you. No bait and switch techniques, only the best value offered every time. Professional equipment and staff to handle any size job We are industry experienced trained and certified professionals for what we do. Safety conscious and aware for property and staff. Licensed and fully insured for up to $2,000,000 for pressure washing services. Handy men and landscapers may be insured for some items but this may not cover pressure washing while on your property. We are environmentally certified and understand waste water and complete compliance with EPA and the Clean Water Act while servicing your business or residence. A 100% Guarantee that you are happy with our work. 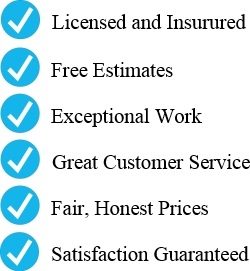 Call us now to set up your fast-friendly free estimate.